Availability: Mid December (12-14th) Annually when the Moon does not interfere. So THIS year, 2018! Location: Varies, usually Alabama Hills (near Lone Pine) or Trona Pinnacles (near Ridgecrest). Trona this year! From sunset to sunrise (photo above) the annual Geminid meteor shower is the most energetic and often the most spectacular. 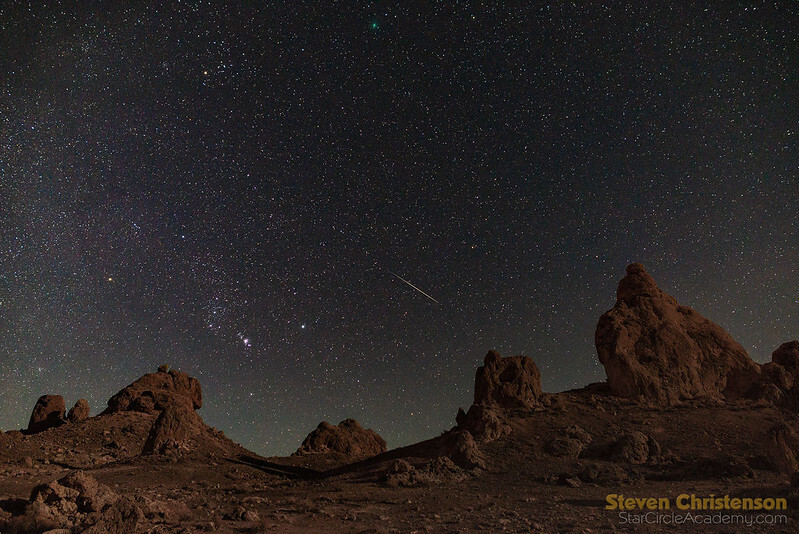 From a dark location as many as 120 meteors per hour can be seen. We will be providing an opportunity to track the sky for long exposures similar to the one shown in this timelapse. This time of year the cool air is often clearer. This is what the foreground may look like. tips and pointers on shooting and post processing. Camera equipment with extra batteries and memory cards. High performing cameras are preferred, but not necessary. And bring a tripod and Intervalometer for each camera. Equatorial Mounts (optional – bring one if you have it already) with necessary hardware to mount your camera. Warm, layered clothing in the event of wind, rain, cold or blowing dust. I recommend bringing some wet wipes as it can get dusty. And extra water and towels. Lip balm (it’s often very dry). For maximum benefit, you will want to be able to sleep days and remain awake at night – much of it anyway! Consider this in your plans for driving. Also, if it is at all possible, you may find it more convenient to meet me at the Starbucks in Ridgecrest (will send the location prior to the event) at 2:30 PM. 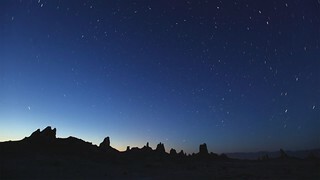 Trona Pinnacles is a large area and it will be difficult to meet at any specific place there. Detailed schedule and location information will be sent to attendees. Meals and accommodations are up to you. You CAN do primitive camping at the location (it’s allowed), or – and I recommend this – sleep days in a nice (or cheap) hotel in town. In Ridgecrest I liked this. If you want something swankier – that’s possible, of course, but there is no Ritz Carlton. I’ve stayed in the > Budget Inn and Suites < and found it quite acceptable. There is a similarly named place that is not so acceptable. From the Budget Inn and Suites to Trona Pinnacles it is 23.6 miles (about 47 minutes). Our base of operation will be Ridgecrest, California and we will spend night(s) out in Trona Pinnacles – most notably on the East side of the Pinnacles (see driving information, below). 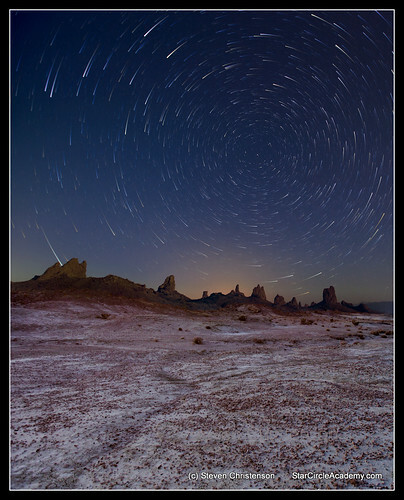 With the desert climate, dark skies, and interesting formations it’s a great spots to observe dark skies and meteors AND have fantastic foregrounds. Camping is allowed in the Pinnacles – it is BLM land.There is a vault toilet on site at Pinnacles – but only one for a large area. Ridgecrest is 20 minutes away. What is it like to drive in Trona Pinnacles? A high clearance AWD/4WD is recommended, but not usually necessary. Steven has no trouble navigating with his Subaru Forester, for example. We will be driving over gravel roads, many washboards, and optionally across a sandy wash. Trona Pinnacles are about 6 miles off of Hwy 178. Not all the roads are well maintained. There will be potholes, and ruts. Accommodations are more expensive and difficult to get in DV and frankly getting an interesting foreground is a bit harder. DV is a backup location in case of weather. Worry about being tired. You can go, set up your camera and go back to bed in town if you like, but watching the event is more spectacular. It might also get cold and windy. Why else might I consider going? 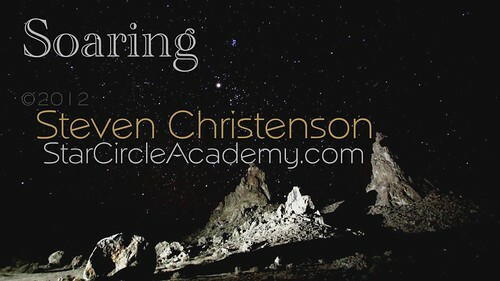 Steven will tell you what he knows about capturing meteors, about meteor showers, and Trona – trust me we know some great spots that aren’t easy to find. Plus you’ll get a chance to learn a bit about the night sky (with an emphasis on meteors). I want to be able to provide instruction for everyone, and it will help if we can fit into fewer cars. I may elect to bring on a second or third instructor in which case I may increase attendance. I’d Like to Bring A Friend, is that OK? If your friend is not a photographer, no problem. In fact, it’s a good idea to bring along another driver. Photographers will be charged at the regular rate. What about the day(s) before and the day(s) after? We offer a discount if you sign up for multiple days, however we are only available during the listed days. But I have to work, can we do it another night? Alas, I do not have power to reschedule the meteor shower! You can try to find a dark location near your home to watch. Can I carpool with someone? It’s actually a great idea. Understand that SCA members come from all over, and arranging a carpool is your responsibility. Can I carpool with you, Steven? No, unfortunately the quantity of equipment that I am transporting plus my co-instructor use up all the space I have. How will I know where to meet you? I’ll send detailed instructions via email to the confirmed participants. What if the weather is really icky? Icky happens. I have some contingency plans for icky including travel… but of course there is only so far it makes sense to go. 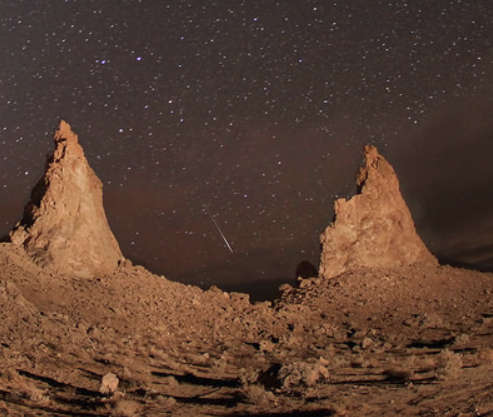 I think I’d like to spend the night in Trona Pinnacles. What should I bring? A fancy RV, a butler and your satellite TV, of course. Seriously, I wouldn’t pick this as the first time to venture into the semi-wilderness. Those of you who are veterans at the out-of-doors will already know what to bring. There is a single vault toilet in Trona Pinnacles. What do I need to attach my camera to an equatorial mount? Be sure the regular tripod screw in your camera body or lens collar is accessible. If you have a quick release plate attached, be sure you have the tool(s) you need to remove and reinstall the quick release plate. What do I need to attach my camera to your telescope? I may bring my telescope(s), but I don’t plan to use them. For astrophotography it is more convenient (and more instructive) for you to use your own moderate telephoto lens that you bring with you. However I do have adapters for Canon and Nikon and 4/3rds lens mounts that will allow what is called “prime focus astrophotography”. If you don’t understand what that means, that’s quite alright here is a translation: bring your Canon or Nikon camera with a wide-angle fast lens and a telephoto lens. If you don’t have a telephoto lens, don’t worry. Be happy. Not a Canon or Nikon? Bring the lenses you own except anything over 300 mm as that won’t be practical. Very interested if you decide to offer it again this year.